TORONTO, Ont. — This year, a thrilling touchdown in overtime might just be the prelude to even bigger drama. The Canadian Football League’s Board of Governors has approved a rule change that will see teams that score a touchdown in overtime be required to go for a two-point convert by running or passing the ball into the end zone instead of kicking for a single point. The proposal was brought forward by the league’s Rules Committee last March, after the change was among those suggested for overtime by fans from across Canada. 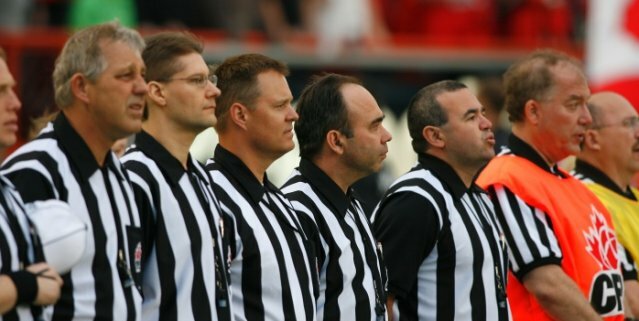 “It’s now official,” said Tom Higgins, the CFL’s Director of Officiating. In 2009, CFL Commissioner Mark Cohon took the unprecedented step of asking fans for their input on proposed rules changes, a step that led to a change in field position following a safety. This year, Cohon issued the call to fans on behalf of the league again, but this time he asked them to pay particular attention to whether the league’s overtime format could be improved. Fans sent in more than 2,000 rules suggestions, with about 1,500 of them focused on overtime. The vast majority said they preferred keeping the league’s overtime format, which has teams take turns scrimmaging from their opponent’s 35-yard-line, instead of changing to a different format, such as two five-minute halves or some other sort of “mini-game”. But many suggested various tweaks to the format. In the end, the rules committee agreed the format should not be changed and decided that the best “tweak” is requiring two-point converts in overtime. Under the current rules, if the score is tied at the end of a game, each team gets an opportunity to scrimmage from its opponent’s 35-yard-line, until it makes a score or loses possession. If the score remains tied, the procedure is repeated at the opposite end of the stadium. If the score is still tied after each team has had two attempts, the game is declared a tie during the regular season. If the game is a playoff or championship game, the same procedure continues until a winner is decided. Will allow a team that gives up a field goal (during regulation time) the option of scrimmaging from its 35-yard line instead of receiving a kick-off. Will ensure there is no penalty for pass interference applied if a forward pass is deemed uncatchable. Will, when a ball is punted, hits the ground and hits a player from the covering team, result in a penalty of five instead of fifteen yards. John Butler, Chair of the CFL Board of Governors, thanked the rules committee for its work. “And on behalf of the Board, and Commissioner Mark Cohon, I want to thank our fans for their input,” Butler added.